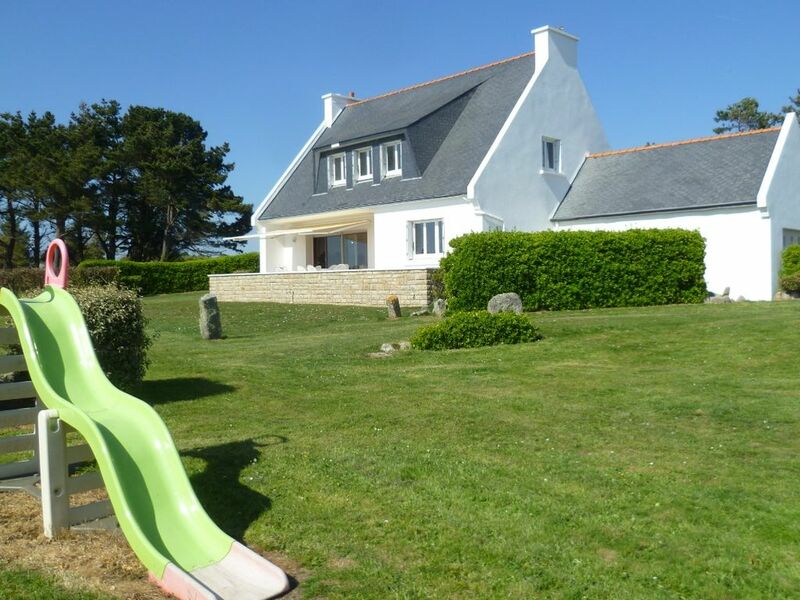 Ideales holiday for families with children, hiking trails, discovery of Concarneau rating at the forefront of trévignon, tours, entertainment and conveniences within 3 km away. Whatever the weather you never tire of the sight of the sea so close, the sound of the waves, the early morning boats that go fishing, if you have the chance to come during a storm I can assure you that the show is beautiful, the sound of the waves against the rocks is impressive, the sea comes sometimes visit us to our limit of the garden! The safety of children is ensured in a walled garden of 2500 m² with games at their disposal. You open the barrier at 10 m you are on the beach, there is no car crossing only a pedestrian path that joins the tip of Trevignon along the sea on one side and the other ponds with swans, ducks, many other birds and a very rich flora, our property is part of a Natura 2000 site that allows the preservation of fauna and flora. You also have bicycles at your disposal to visit the surrounding paths. We will be present at your arrival and at the end of your stay. If you have a problem during your holiday we will be there to intervene because we live 25 km from the rental. The ground floor of the bathroom is very practical it has a shower cabinet with a sink and a toilet, having been recently refurbished, we chose warm colors for the tiles, the upstairs bathroom has a large bath, bidet, sink and a storage cabinet, the toilet is separate. rent is very suitable for families with children because the garden is closed and access to the beach is directly without passing car With regard to disabled access there is everything you need on the ground floor for people having difficulties to get to the floor against by people in wheelchairs can not be acceuillies because the width of the doors is not not enough. From 2016 we're providing our tenants bikes that will allow them to visit all the rich surroundings by small paths and to follow the price of up to Trevignon Concarneau. Pour les amoureux de la Nature et de la Mer. Je confirme que tout était comme décrit dans les précédents avis. Un Grand Meri! La situation de la maison est exceptionnelle. C'est au calme. Tout est bien pensé par les propriétaires qui sont d'ailleurs très sympathiques. Cadeau de bienvenue qui nous a touchés. La maison est très fonctionnelle et très propre.Grand terrain pour se détendre.Nous vous recommandons vivement cette location ! Encore merci pour ce merveilleux W.E. Nous ne réservons plus que cette magnifique maison de famille depuis 3 ans ! Sa situation est exceptionnelle ! Au calme, face à l'océan que nous voyons à 180° ! Les couchers de soleil sont merveilleux ! plus beaux encore que sur les cartes postales.. C'est un lieu magique, où nous n'avons aucun mal à nous ressourcer.. La maison est très fonctionnelle ! les espaces sont larges. Sa disposition en fait un vrai lieu de vacances pour les familles. Son grand jardin fait la joie de petits et des grands. Les propriétaires sont charmants ! Nous ne pouvons que conseiller très vivement cette location ! Merci encore !! Nous avons passé une semaine formidable. Les enfants ont apprécié le grand jardin avec son toboggan et la proximité de la plage. L'endroit est calme et la maison fonctionnelle. Elle est idéale pour passer des vacances en famille!! Pendruc is between Pouldohan and the tip of Trévignon. In the cove of Pouldohan you enjoyed water sports, Concarneau very touristy town is about 5km, the walled town with its ramparts offers all summer variety shows late into the night. Also at Concarneau you can also watch the landing of fish in the auction. Opposite Pendruc 4km you superb Trévignon with its small markets crab, crawfish, lobster and fish sold directly by pècheurs.